Pépin, Carl. "The Royal 22e Régiment". The Canadian Encyclopedia, 10 April 2017, Historica Canada. https://www.thecanadianencyclopedia.ca/en/article/the-royal-22e-regiment. Accessed 25 April 2019. The Royal 22e Régiment (R22eR), whose headquarters are at the Citadelle de Québec, is one of the three infantry regiments of the Canadian Regular Force. It is a francophone regiment made up of five battalions, of which three belong to the Regular Force and two to the Reserve Force. 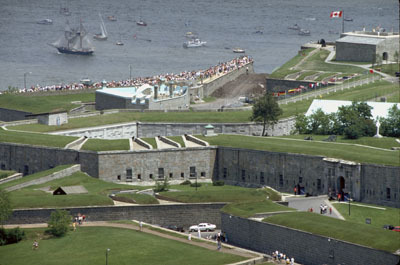 In the 1870s, Governor General Lord Dufferin persuaded the city not to demolish the fortifications, thus defining the historic character - and tourist potential - of old Québec (courtesy National Defence). The Royal 22e Régiment (R22eR), whose headquarters are at the Citadelle de Québec, is one of the three infantry regiments of the Canadian Regular Force. It is a francophone regiment made up of five battalions, of which three belong to the Regular Force and two to the Reserve Force. In 2014, the R22eR will celebrate its 100th anniversary. The regiment has participated in all of Canada’s major military engagements since the First World War, including the United Nations peace missions and the campaign in Afghanistan. The regiment is made up of soldiers from Québec who serve Canada on a variety of domestic and foreign operations. The first three battalions of the regiment fall under the Regular Force and are made up of mechanized infantry units (1st and 2nd) and light infantry (3rd). The 4th and 6th battalions are comprised of militia members stationed in Laval (4th) and Saint-Hyacinthe (6th). In an environment where the primary language of work is French, soldiers of the R22eR are volunteers who perform tasks suited to this type of unit: garrison operations, peacekeeping and peacebuilding, combat operations, etc. The battalions of the R22eR may therefore be called into action at any time and in various locations around the world to carry out Government of Canada missions requiring a military presence. The R22eR also plays an important role in Canadian heritage. It is the most significant regiment in Québec in terms of numbers and also the best organized in operational terms. Thousands of Québécois have served in its ranks since its inception in 1914, in combat operations as well as on peacekeeping and peacebuilding missions. When it was raised in October 1914 at the beginning of the First World War, the R22eR was known as the 22nd Battalion (French-Canadian). The unit was created in response to popular demand for a regiment in which French-Canadians could serve in their mother tongue. The 22nd was the only francophone infantry unit in the Canadian Expeditionary Force that was active on the front. The Battalion arrived at the front in Belgium in September 1915. The 22nd participated in several operations between 1915 and 1918. Its first major attack took place at Courcelette, France, in September 1916. The French-Canadian soldiers, commanded by Lieutenant-Colonel Thomas-Louis Tremblay, pushed back repeated enemy assaults and held the village while surrounded on all sides for three days and three nights. Of the 800 men who took part in the initial assault, 118 were left three days later. Reinforced more than 10 times during the war, the 22nd fought until the end of the conflict in November 1918. The Battalion’s return to Canada in May 1919 was marked by its dissolution. However, it was reactivated in 1920 as part of the formation of a new active militia under the name of the 22nd Regiment. In June 1921, the unit received the “Royal” title from King George V in recognition of its military accomplishments in Belgium and France during the Great War. 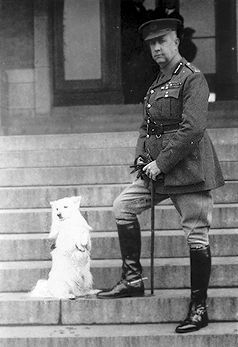 In 1928, the regiment adopted the name that it is known by today, the Royal 22e Régiment; its commander, Lieutenant-Colonel Georges Vanier, was the driving force behind the change. When the Second World War broke out in September 1939, the R22eR was mobilized and sailed to England at the end of the year. The regiment spent nearly the entire conflict on the Italian front. It disembarked in Sicily in July 1943 and withdrew from northern Italy in February 1945. From March to May 1945, the regiment was part of the Canadian Army, which was fighting in Holland and Germany at the time. With the Korean War, the R22eR increased in size from one to three battalions. These battalions took turns serving on the Korean peninsula between 1951 and 1953. In the decades that have followed, the regiment has carried out peacekeeping and peacebuilding missions for the United Nations. The most significant of these include Cyprus from 1964 to 1992, a number of missions in the Former Yugoslavia (from 1992 to 2001 under the UN and NATO), and Haiti in the mid-1990s. An entire battalion was also sent to Haiti in 2010 after the earthquake. In 2007, members of a number of units from the 3rd Battalion of the R22eR were deployed to Afghanistan as part of NATO’s International Security Assistance Force in the Kandahar region. In 2009, members of the 2nd Battalion of the R22eR served in the same region. Troops belonging to the 1st Battalion carried out a similar mission in 2010, while other members have been training the Afghan police and army since 2011. There are many symbols that have made the R22eR what is has been since 1914. The regiment’s most precious symbol is its flag, which represents its body and soul and attests to the pride and honour associated with military service. Many emblems were adopted during the First World War. The R22eR monument located at Place George-V in the city of Québec illustrates the strength of regimental tradition in the area and promotes military heritage outside military institutions as such. Inaugurated in 1989, it lists the names of soldiers who lost their lives in the line of duty. The regiment can also be recognized by its insignia, which depicts a beaver inscribed with “22,” “Régiment canadien-français” and the regimental motto “Je me souviens.” Appearing on the flag, hats, and all other objects of regimental life, the beaver is yet another symbol by which the general public and other Canadian and foreign military forces can identify the regiment. The specific symbols and traditions of the R22eR are displayed in detail at the museum of the Royal 22e Régiment, which has been located at the Citadelle de Québec since it was founded in 1950. The regimental museum plays a significant role in spreading knowledge and making the public aware of military traditions. A number of local, provincial, national and international activities have been planned for the 100th anniversary of the founding of the R22eR in 2014. Each activity will illustrate the rich past of this regiment, embodying as it does the integration and active participation of francophones in the Canadian Forces. ROYAL 22E RÉGIMENTEssential history of the Royal 22e Régiment from the website for National Defence and the Canadian Forces. Citadelle of QuébecThe website for the Citadelle of Québec, home of the Royal 22e Régiment since 1920. Van DoosA history of the Royal 22e Regiment (Van Doos), the most famous francophone organization of the Canadian Forces. The Italian CampaignAn illustrated feature about Canadian military action in the bloody Italian Campaign during the Second World War. From junobeach.org.